Once a locals secret, mountain bothies have made a comeback with hikers and outdoor enthusiasts in 2018 with the release of The Bothy Bible, a handy book that details over 100 bothies throughout Scotland. A bothy is a mountain shelter in Scotland, available for anyone to use for free. A bothy will usually consist of one or more bedrooms, with a common area that has seating and a fireplace. Bothies are fairly basic shelters- so don’t expect mattresses, showers or toilets- but that is all part of the charm of bothies. They are maintained by the Mountain Bothy Association (the MBA), but it expected guests staying will do their part to ensure the bothy stays clean and tidy for the next lot of guests. It wasn’t until I was halfway through my hike of the Scottish National Trail that I stayed in my first bothy. And oh boy, did I appreciate it! Wild camping is great, but packing your tent up in the rain isn’t. Many of these are Cape Wrath Trail bothies too. Bothies also have a very special feeling about them; they offer you security in some of the remotest parts of Scotland, and staying in a bothy isn’t something many people experience. This is why I believe that in order to have a traditional and unique experience when visiting Scotland, you should spend at least one night in a bothy! A surge of interest in mountain bothies can lead to problems, so make sure you are well aware of the mountain bothy code before staying in any of these bothies. Groups of 6 or less should only stay in bothies. To avoid overcrowding, the MBA recommends visiting bothies in groups of 6 or less. Be respectful to everyone in the bothy. Bothies are for everyone to enjoy. Just because you’re there first doesn’t mean you have more rights than late arrivers. Be kind, share the space. Be aware that everything you bring into the bothy will need to remove. Once I made the mistake of carrying too much food into a bothy. Luckily much of it was non-perishable so the next lucky visitor could eat it! Keep this in mind however; you don’t want to ruin your hiking experience by carrying excess weight and you do NOT want to be the person that leaves stuff behind that attracts rats or other vermin. Now that you know a little more about mountain bothies in Scotland and the mountain bothies code, let me share with you my 10 favourite bothies! Dalnashallag bothy is more of a shelter than a bothy you can comfortably relax in for the evening. It is quite small, but charming nonetheless. This bothy is pointed out on the Badenoch & Upper Strathspey OS map, but is better known with the locals and those hiking the East Highland Way. This is what makes this bothy special- noone, aside from those that live in the area really know about it. Located nearby are the remains of an old village- you’ll need to look very closely for these but they are marked on the OS map. The bothy sits at the top of Strath an Eilich, with the river Calder located a convenient 20 metres away. It is a short hike from Newtonmore and Laggan. Knockdamph bothy (meaning ‘Stag Hill’) is a traditional, older-style bothy, and one of the very few bothies that has beds! They’re not that fancy, so don’t get too excited, and you will definitely need to take a sleeping bag and pillow with you when staying here. The bothy dates back to the early 1800s, and if you’re lucky you’ll hear the haunting cry of the wild stags that call this area home. This area was once home to many farmsteads and townships, however these dwindled after the Highland Clearances. Knockdamph bothy sits close to the head of Loch an Daimh and is mostly used as shelter for hikers on the Cape Wrath Trail or those seeking solitude. The two large, communal rooms both boast fireplaces. A clear 4×4 track from Ullapool can be followed to reach this bothy, which is marked on the Beinn Dearg & Loch Broom OS Map. Glendhu bothy was once used for storing deer carcasses that were shot by guests catching the boat in from Kylesku. Don’t let this put you off though- the bothy has been renovated long since, and is modern in comparison to other mountain bothies in Scotland. Next to the bothy is an old stalkers cottage. This bothy can be reached two ways; hiking north from Inchnadamph on the Cape Wrath Trail, or the much easier option- hiking from Kylestorm along a 4×4 track. The bothy consists of four rooms, three of these being bedrooms (two upstairs, one downstairs) and a large common area with a fireplace. The bothy is rife with wildlife, and seals are often spotted bathing in the loch. Keep an eye out for the friendly Highland ponies that live on the estate! The bothy is marked on the Loch Assynt OS Map. Shenavall Bothy is a popular bothy mainly used as a base for those hiking the ‘Fisherfield 6’; a series of munros located in the remotest part of Scotland. Though technically they are now ‘the Fisherfield 5′ – after one of the munros (Beinn a’ Chlaidheimh) was discovered to be slightly short of the 1000m to qualify. The five munros are: Sgurr Ban, Mullach Coire Mhic Fhearchair, Benn Tarsuinn, A’ Mhaighdean, and Ruadh Stac Mor. One of the things that makes this bothy different from many is that while it is located in one of the remotest areas in Scotland, it’s not uncommon for it to fill up on weekends. If you’re looking to stay in a bothy that bolsters a community culture of hikers and outdoors- pay a visit to Shenavall during a weekend in summer. Shenavall bothy is marked on the OS map of Gairloch & Ullapool. Known as one of the remotest bothies in Scotland, Maol Bhudihe is a welcome sight hiking in from either end of the Cape Wrath Trail. Surprisingly, two families have occupied this bothy since it was built during the mid-19th century; one family raising a brood of 10 children here! Accessing this bothy comes with its challenges- it is surrounded by three rivers, which can be impassable in spate. There has even been the odd visitor here during winter, which is a feat hard to fathom considering the peat-bog terrain and winding rivers would be covered in snow. Combined with the hearty trek to actually reach the bothy from Strathcarron, Craig, or Morvich, spending a night here sure is something special. Ensure you take adequate supplies with you if visiting this bothy. Maol Bhuidhe bothy can be found on the Glen Carron & West Monar OS map. Originally the route the bothy is built on was a staging post to an old droving road between Skye and Dingwall and Inverness, where the livestock markets were held. The bothy was built after the road fell out of use to house a shepherd and his family in the early 1800s. The bothy housed many occupants, but then eventually closed. It was reestablished in the late 20th century as a mountain refuge in memory of two mountaineering friends who tragically died in a climbing accident. It can be found on the Loch Alsh, Glen Shiel & Loch Hourn OS map. Don’t be fooled thinking that all bothies are like Ruigh Aiteachain- they are most definitely not! This bothy was recently rebuilt and if bothies were given star ratings, Ruigh Aiteachain would definitely be 5 star! Located at Glen Feshie in the Cairngorms National Park, Rugih Aiteachain was built next to the site of a building where Edwin Landseer drew the preliminary sketches of the famed Monarch of the Glen. The only thing that remains of the house where Lanceer drafted the Monarch is the chimney- which is viewed from the window of the bothy. The whole area of Glen Feshie gave Lanceer inspiration for his painting, and there have also been many movies filmed here, including Victoria and Abdul, staring Judi Dench, and The Queen, starring Helen Mirren. Ruigh Aiteachain can be found on the following maps: Kingussie & Monadhliath Mountains and Map of Braemar & Blair Atholl. The first thing many will notice about Kearvaig bothy is that it is fantastically located right on Kearvaig Bay- the water lapping the beach less than 100 metres away! Wake up to a white sandy beach with the awe-inspiring sea stacks rising from the water. In summer, birdlife is abundant with guillemots, razorbills, kittiwakes and puffins nesting in and around the surrounding cliffs of Clò Mòr (the highest cliffs in Britain!). Spending a night in this bothy is an experience you won’t soon forget. The bothy was once a hunting lodge before being abandoned. The MBA renovated the bothy in 2009, and it is now known as one of the most significant bothies in Scotland. 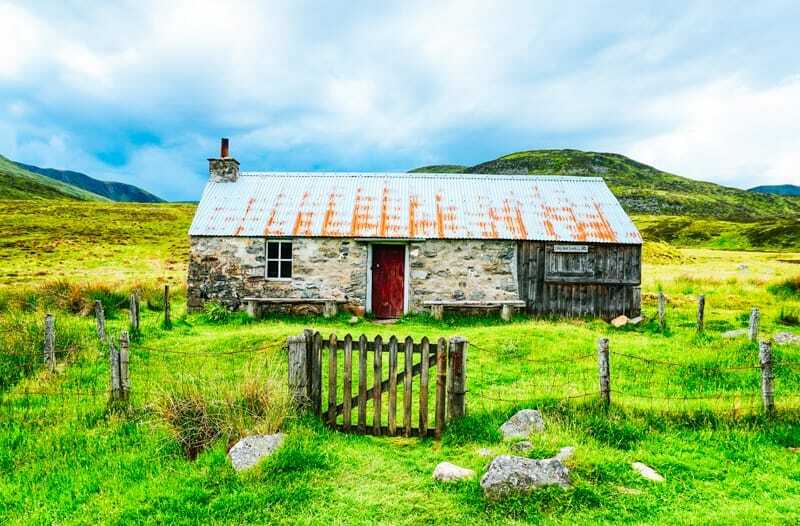 The only way to reach this bothy is by hiking or cycling in- those ending the Cape Wrath Trail or the Scottish National Trail may want to spend the night once they’ve reached Cape Wrath. There is a bus and ferry service that takes tourists to Cape Wrath from Durness, and they can drop you near the bothy if requested. Kearvaig bothy can be found on the Cape Wrath OS Map. The Schoolhouse bothy is located a short distance from Knockdamph bothy, along the Cape Wrath Trail. As the name suggests, this bothy was once a school house! By the 1920s up to 20 children were being schooled here. The bothy has been renovated in a similar style, complete with a chalkboard hanging on the wall for hikers to write messages and a complete Shakespeare book collection! A lovely river is located nearby, and makes an excellent swimming spot on a warm summer’s day, or if the water is too cold, lounge underneath the shelter of the large trees that grow alongside it. Access to this bothy is easier than most- you can actually drive here! The surrounding hills still give this bothy a remote feeling, however. The Schoolhouse bothy can be found on the Beinn Dearg & Loch Broom OS Map. The view of Loch Glencoul is the reason this bothy tops the list of best mountain bothies in Scotland! Glencoul bothy is located in one of the most beautiful locations in Scotland; surrounded by mountains and at the head of Loch Glencoul. You just cannot beat the view of Loch Glencoul, which is virtually on this bothy’s doorstep. A family lived in the house next to the bothy (which was used as a school) during the late 19th century until the 1950s. The bothy itself is small, containing two rooms, one containing a fireplace, with room to sleep for 4 (maybe more at a squeeze). Located close to the bothy is Eas a Chual Aluinn (waterfall of the beautiful tresses), the Uk’s highest waterfall. The hike to the bothy from the south is known as one of the hardest sections on the Cape Wrath Trail, and strong navigation skills are needed. If hiking this section (you’ll start in Inchnadamph), you’ll be rewarded with views of the loch that only become more and more grand as you get closer to the bothy. If hiking from Kylesku, you will pass Glendhu bothy and continue around the loch, making your way through unmarked trail uphill before joining a clear path that leads to Glencoul bothy. The bothy can be found on the Assynt & Lochinver OS Map. Wow! I am British and have never heard of such a concept. We often stay in Youth Hostels and these have a similar feel at times. Saved for a future visit to Scotland! Thank you. What a fascinating read! I had no idea about bothies. I’m heading to Scotland next week, but the only hiking I’ll be attempting is Arthur’s Seat. The Schoolhouse bothy is too cute! I actually had no idea this was a thing, but now I do I really want to go hiking! I heard about bothies before I walked the West Highland Way last year. I didn’t stay in one but I love your list! Especially since it includes the far northwest which I want to spend more time in. Thanks for this great list and wonderful advice! I’m more of a glamper then a camper but these bothies sound like they’d be a halfway house between both. I particularly love the look of the Schoolhouse one. I’ve always dreamt of staying in a bothy. It sounds like such a unique experience in the mountains. Thanks for sharing your favourite ones – now I know where to start! It’s on my bucket list to spend a night in a bothy, but haven’t managed it yet. Great list!